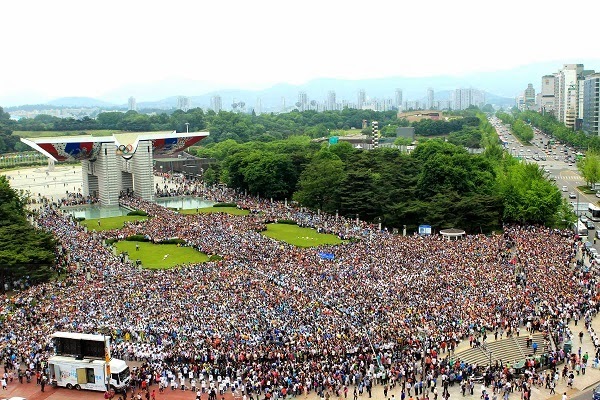 Seoul, South Korea- On May 25th 2015, 200,000 youths and women from all around the world are expected to participate in the 2nd Annual Commemoration of the Declaration of World Peace and Peace Walk Festival led by International Peace Youth Group (IPYG) and International Women’s Peace Group (IWPG), both HWPL’s affiliated organizations. Well-known places like Carson City California, Mindanao Philippines, and Royal Bafokeng Nation South Africa already have recognized May 25th as ‘Heavenly Culture, World Peace, Restoration of Light (HWPL) day as a day of peace, unveiling the peace monuments. 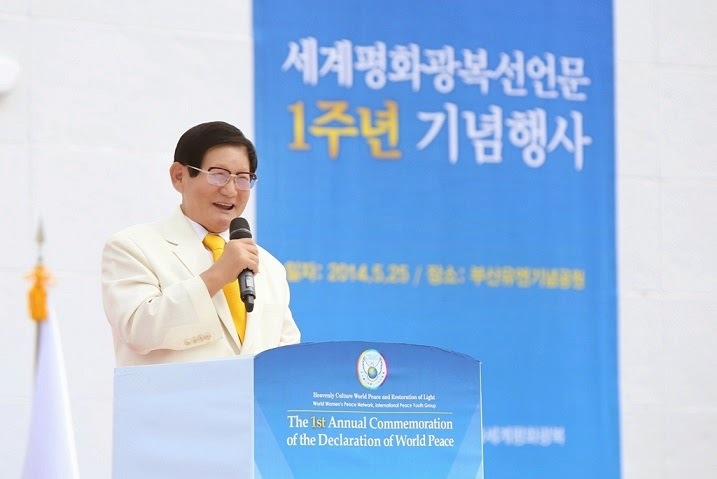 For the first time in mankind history, a peace advocate and Chairman of HWPL, Peace maker Man Hee Lee, proclaimed the Declaration of World Peace on May 25th 2013, in front of youths from all around the world. Since then, the declaration has become the standards and goals of HWPL and its members and affiliated organizations have striven to achieve them. Currently, the efforts to practice what is stated in the declaration of World Peace are noteworthy in every corner of the earth. The Peace Walk Festival will take place to commemorate and celebrate the 2nd year anniversary on the declaration of World Peace. The youth, women, political, religious, and secular leaders will march for and speak out against the unjust and sorrowful history of war and the event will surely spread the true message of peace that the whole world is uniting as one to end all wars, putting efforts to establish world peace so that no one on this earth will experience painful and heart-breaking legacy of wars. The Peace walk will be held not only in Seoul, the very spot that the declaration was first proclaimed but also in over 50 cities from 30 countries including New York, San Francisco, and Berlin. It will hold special meaning as there will be a time for silent prayer to honor those lives lost in wars as well as in the recent earthquake in Nepal. To meditate on the purpose and true meaning of the declaration of World Peace, ‘525 Hi! Five’ campaign will be launched to unite all people who love and live for peace to achieve the common goal by hands. This campaign signifies spreading small actions of peace done by one’s hand which will finally reach out to the rest of the world. The collection of hi-fives from all over the world symbolizes the pledges to the establishment of the world of peace. In addition to the accomplishments above, the mayor and members of the city council of the city of Alexandria, Virginia has acknowledged HWPL’s dedication in bringing people of different religions together for the establishment of peace and has recently proclaimed September 18th as the ‘World Alliance of Religions Day’ to commemorate the World Alliance of Religions’ Peace (WARP) Summit, an unprecedented international peace festival held by HWPL on September 18th in Seoul, Republic of Korea. William D. Euille, the mayor of Alexandria is urging all government departments and agencies, organizations, schools, places of worship, and individuals from all walks of life in Alexandria to commemorate the World Alliance of Religions Day. He also has expressed his sincere gratitude for peace maker Man Hee Lee’s spirit of volunteerism and efforts toward preserving and fostering culture of peace. The growing support and cooperation of the international community for the observance of the World Alliance of Religions Day as well as HWPL Peace Day have demonstrated that the peace works of HWPL provide an effective way to cease conflicts and promote a peaceful world.